The short stories in Gabriela Torres Olivares’ Enfermario (translated from Spanish by Jennifer Donovan) guide us through meta/physical hauntings. I say haunting because there is a degree of psychic anguish these characters feel due to being embodied, around other bodies, and in their mundane yet precarious circumstances. Olivares explores a soccer game after party turned murder investigation; a coroner with jamais vu; a family whose daughter has Tourette’s and wants to attend a game show; a cancer fairy tale about the otherness and memory stored in cells. 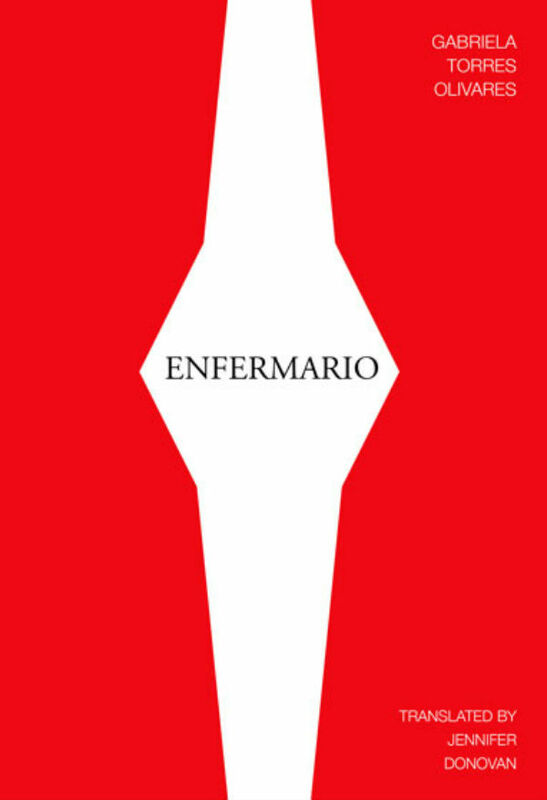 Enfermario evokes sickness, being infirm. Body and illness figure prominently into these narratives. While readers may search the text for an antidote for theses characters’ various conditions, Olivares suggests that they will find only gestures and improvisations that make the present bearable as we encounter the future. The collection’s first story, “thirteen Point Two,” begins, “Vasudeva cries at night. Adamant, she tells her mommy that it hurts five centimeters above her shoulder. Mommy says that there’s nothing above her shoulder.” The child Vasudeva asks her mother to soothe the phantom pain, the mother reluctantly obliges, performs a “reiki to nothingness,” a laying of hands on the void. Already, we know that relief is only a fleeting suspension of pain. We are told Vasudeva feels relief, but in her dreams she “splits into pieces.” She is seven and dreams of death and reincarnation (as a flower, a purple, beautiful one), she wants to know how it feels to not have a body. In this instance and many others throughout the collection, Olivares’ characters are concerned with bodies and their consciousness, and asks just how separate the two are. I read this first story while sitting in my neurologist’s office, waiting to discuss pain management strategies. Flares or episodes I call them, because they are both finite and infinitely sequential. Whether I am the thick of my pain or not, I cannot fathom my life without the bodily distress and I, too, have wondered how it feels to not have a body. Vasudeva is a child philosopher: she poses what it would mean to be a consciousness or an “essence at one hundred percent,” then in the next breath the narration tells us of her desire for a little sister, and her mother’s inability to provide one. The story pivots to reveal the origin of Vasudeva’s pain (having been separated from her conjoined twin) but with attention to how the physical/material world complements the spiritual. The story explores how this family negotiates the absence, of a child, and psychic nothingness. Olivares asks what it means to be and act amidst this lingering melancholy. Other stories in the collection share similar concerns, some more or less surreal. In the story, “On a Pulseless Woman Walking (body seeks Liberty),” we encounter a speaker confronted with a strange sight: “I awake. For the first time a hackneyed wine-colored muscle lay on the bed sheet. I try to lodge it into the left side of my chest, but slippery— impalpable/impossible— it leaps in its systolic-diastolic exercise.” The image of a body putting itself back together physically and emotionally forms in my mind. The left ventricle observes the speaker “tearfully” and an aorta bids “farewell in cardialogue.” Olivares reminds us that “farewell is not see you later,” as if to say, this is as absurd as it is morbid. Body teases speaker as it becomes more and more emboldened. “Remnants of my anatomical atlas find free will. Anarchists. Buddhists discover fragmentation: isn’t this what you were searching for?” Body throbs without its speaker both “proud” and “in another latitude.” Olivares’ sentences here are terse and fragmented though still legible. Bodies and parts of bodies have lives beyond our comprehension; they perhaps have uncanny narratives we cannot decipher or even read in the first place. Enfermario is a row of sick beds, each with its own body resting or writhing, with varying symptoms. As readers, we walk from bedside to bedside, observe and feel the evocative discomfort of each. Olivares’ narratives are set before us for examination intellectually and emotionally. She does not ask us to provide a remedy, though she takes to task the uncanny within the mind and body connected. Further, Olivares does not problematize bodies or view them moralistically; rather, this work reveals the spectrum of mental/physical unrest and the ways in which we negotiate that space. Olivares’ narratives theorize how we can exist and act in the world given how we relate to the uneasy state of our bodies.